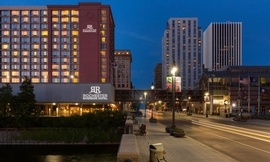 BuyReservations.com is committed to providing the best airport hotel options for ROC. Our airport hotels, which include parking, and airport shuttle transfers, are a great alternative to airport parking*. We strive to get the most affordable rates at the most reliable hotels. Our Park Snooze and Fly package will make your travel experience seamless and convenient at Greater Rochester International Airport. *Unless otherwise noted, see Park Snooze and Fly Package Information. Transfer Notice: Hotel does not offer airport shuttle service on the following Holidays: Thanksgiving, Christmas Eve, Christmas Day, New Year Eve, New Year Day, Memorial Day, Labor Day and Independence Day. Hotel does not offer airport shuttle service on the following Holidays: Thanksgiving, Christmas Eve, Christmas Day, New Year Eve, New Year Day, Memorial Day, Labor Day and Independence Day. Our Park Snooze and Fly Packages are an excellent way to make airport parking convenient and affordable. If you have a late landing at Greater Rochester International Airport, staying the night of your return is also an option. You can take advantage of parking your car at the hotel prior to your flight and getting well rested at the hotel the night of your return. Our hotels allow for late arrival check-in so you know your room will be ready even if you have a late landing.